Last month, the Bank of England published a very interesting article about payment technologies and, in particular, the evolution of digital currencies like Bitcoin. You can access it here, and I warmly recommend that you read it: it’s an easy read, it provides a useful overview of the evolution of payment systems, and is a really great introduction to the principles and mechanics of digital currency. There is also an associated video here. 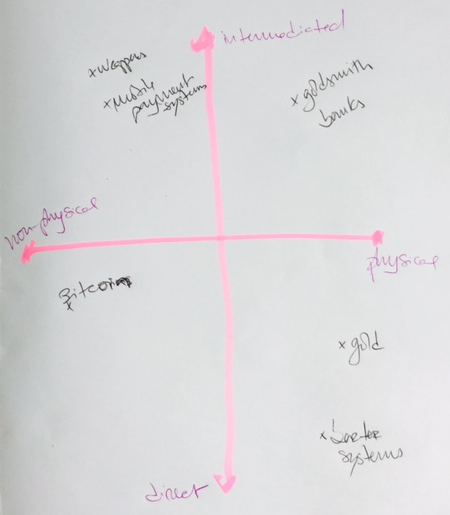 As I was reading this report, I couldn’t help visualising payment systems as a market where the various products on offer could be compared and contrasted along a number of dimensions. And, which, because of this, appealed to different customer segments. Just like sun lotion. Sun lotion solves a problem: allowing us to be outdoors protected from harmful sun rays. There are various products on offer in this market, which may be classified along a number of dimensions such as the extent to which it blocks harmful sun rays. 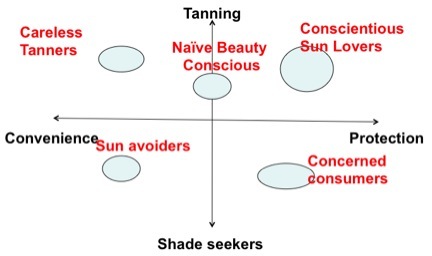 Buyers in this market opt for one product or the other depending on a number of factors such as the benefit sought (e.g., maximum protection vs. convenience) or attitudes (e.g., whether they like to stay in the sun or in the shade). At one end of the spectrum, the system may rely on the exchange of a physical token, such as cotton, salt, gold, coins or notes. At the other end, no physical tokens are exchanged, only records – for instance, on paper (such as record of debits and credits on an account), or electronic. On the one hand, users may carry the medium of exchange with them and make payments, directly – e.g., someone carrying gold coins in a purse, which they give to another person in exchange for a good. Alternatively, they use an intermediary to make that payment – be it depositing money in a bank, which will be withdrawn by the other person, or paying with a debit or credit card. They opened a new strategic window by allowing users to exchange ‘electronic’ money directly (bottom left quadrant), without the need for a central intermediary. Just like sun lotions, buyers in this market prefer some solutions to others; and some manufacturers will perform better than others along each of these dimensions. But, overall, I think that we are seeing a change in the market of ‘payment systems’ similar to that witnessed in the publishing industry or, more recently, manufacturing (because of 3D printing). What do you think of this interpretation? Does it make sense to you? How can it be improved? Posted on October 6, 2014 October 6, 2014 by anacanhotoPosted in Marketing in everyday lifeTagged Bank of England, Bitcoin, Mobile payment, Positioning map, strategic windows, Sun lotion.